Leading Manufacturer of liquid medical waste treatment system, liquid medical waste disposable system, liquid waste treatment system and biomedical liquid waste treatment system from New Delhi. Semi Atomated System to treat Medical Liquid Waste. Treats Waste as per the Pollution Control Board Guidlines. Made of Stainless Steel 304 Grade. Treats Your Liquid Medical Waste. Capacity-125 Liter, Stainless Steel Body. The waste is treated as per the guidelines of Pollution Control Board. CE & ISO Certified. The waste is treated as per the guidelines of Pollution Control Board. 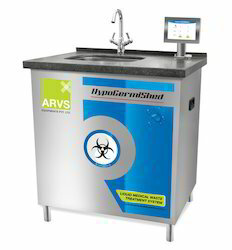 - Automated System to treat Liquid Medical Waste at the point of its generation. - Machine capability to treat the liquid at any level between 25Liters to 125 Liters. - Made of stainless Steel 304 Grade. - Provision for attachment of 2 additional work stations. - It has alarm when full capacity reached. - The treated liquid waste is discharged automatically at the completion of treatment cycle of 50 minutes. - The waste is treated as per the guidelines of Pollution Control Board.